How Would Your Life Change If You Could Sell More Artwork? Most of the painters I know want to sell more artwork. They tell me how their lives would change if they could simply double or triple the amount of art they are selling today. For some people, more income buys freedom, the ability to quit a job they would rather not be doing so they can paint full-time. For others, more money would eliminate the pressure of trying to make ends meet. For still others, it might buy them travel, or comfort, or retirement, or the ability to own something they never thought they could own. I don't know very many painters who do it for the money alone. Most would paint even if they didn't get paid to do so. Of course, if art is their means of making a living, selling paintings is a necessity. Yet most of the painters I know are barely getting by on the sale of their artwork. Most have been struggling to survive since the economy crashed in 2008. What about you? What would change in your life if your sales were thriving? What if you could double, or triple, your sales in each of the next couple of years? What if you could watch your art sales skyrocket? What if money was the least of your worries? Stop. Close your eyes for just a moment. Ask yourself: How would my life change if I could gain financial freedom as a painter? I want you to imagine what you would do differently. Now ask yourself this important question. Do I honestly believe I can continue doing what I've been doing and dramatically improve my art sales? Einstein called it the definition of insanity: doing the same thing over and over again and expecting different results. What are you going to change about your behavior to fix your art sales problem? Yes, the economy crashed and loads of galleries went under and many artists are not selling. So it's easy to blame the economy. Yet I know many artists and galleries that are thriving. Most made up their minds that the bad economy was not going to hamper their success. Though they have to work harder and smarter, a successful attitude has made them believe there is a way to succeed. What is your attitude? What do you believe? If you believe the economy is your problem and everything will be OK when it improves, what if the economy does not improve for 10 more years? Are you willing to wait it out? Or should you make up your mind to succeed no matter what? There are a few exceptions, but in most cases the most financially successful artists are the artists who are best at marketing. Some are natural marketers who do it without knowing it, but most are intentional marketers. There are brilliant artists who have never sold a painting, and there are sub-standard painters who have become wealthy. Imagine what can be done with your career if we can turn you into a great marketer. Great marketing is like gardening. You need to prepare the soil, plant seeds, provide the right amount of water and sunlight, weed the soil, and harvest at the right time. Some people are brilliant gardeners. My intent is to make you a brilliant marketer. As you know, I've been writing about art marketing for years, and I've helped many artists grow their sales dramatically. One artist I helped has had the best years of sales in his 25-year career as an artist. And did I mention that there was a recession going on? It's very rewarding when I can offer ideas and watch the lives of artists and galleries be transformed. But this artist had to shed his old ways of thinking and adopt new ideas. A Lifetime of Marketing Lots of people teach art marketing, and many of them are very good. I'm not an art-marketing expert. I'm just a entrepreneur who has started many successful businesses, helped hundreds of others grow their businesses, and seen lives transformed by ideas. I apply my knowledge as an experienced marketer to art. I own my own business. My marketing has to work, or I don't eat. It's my goal to teach you no-fluff, get-down-to- business marketing because I know you too have to make it work. During the upcoming Plein Air Convention (April 12-15), I've decided to do three "early-bird" sessions for those who really want to get the worm ... and master marketing. 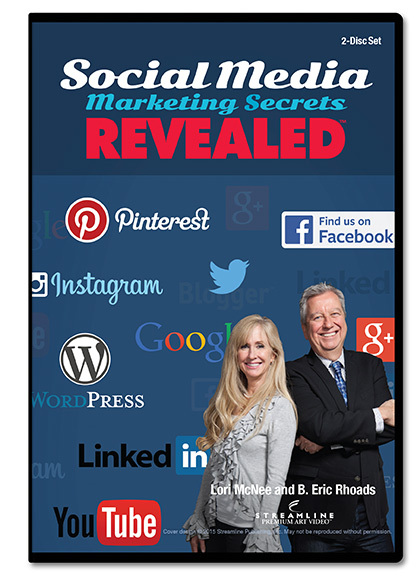 We will have almost five hours of training, the longest marketing seminars I've conducted to date. If you listen, take great notes, and take action when you get home, I believe you'll double your art sales in one year. I'm not charging extra for these three sessions. They are available to anyone who registers for the convention. Recently I did a one-hour marketing session in San Francisco for the California Art Club. One artist came up to me afterward and said, "This was spellbinding. I'm going to come to the convention just so I can attend your Marketing Boot Camp." I was honored that I was able to help the people who were present. I'd like to do the same for you. There are three things you need to consider if you're not happy with the way things are going in your art career. 1. Am I motivated enough to get out of my comfort zone? 2. Am I motivated enough to try something new? 3. Am I motivated enough to invest in success? Bottom line is that change requires discomfort. When you go to the gym, you don't build strong muscles unless you strain them. It requires hard work. Muscles have to be torn down to be rebuilt. The same is true with the muscle in your head. If you want change, it requires discomfort, strain, and intentional effort. If you come to my Marketing Boot Camp willing to change, willing to work at it, willing to take action based on what you learn, you will dramatically alter your future. I know of several people who consider the convention ticket worth the price just for three mornings of Marketing Boot Camp. I won't let you down. I have helped hundreds of artists, I've helped hundreds of businesses and brands, and I will help you transform your career. But it requires a first step. It requires admitting that you need to be a stronger marketer. It requires wanting it enough that you're willing to do what it takes. Will you take the first step? Is it worse to invest some money now for the chance of selling more art? Or is it worse to wait and hope that things will change? Maybe you're telling yourself, "In the future when I sell more paintings, I can afford to go." That is kind of like saying, "Maybe I should go to law school, but first I'll practice law so I can afford it." Why do the top brands in the world get bigger? Why are the top artists selling paintings for such high prices? Why do they continue to sell when others do not? They understand the basic principles of marketing and practice them religiously. You don't become a big gun and then start marketing, you market your way to success. I'll show you how. 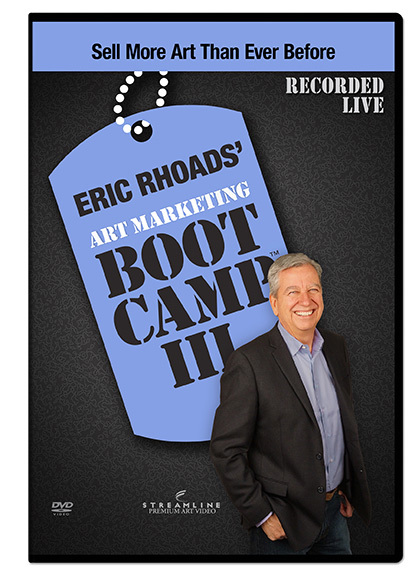 To sign up for Marketing Boot Camp, you need to sign up for the Plein Air Convention. The current price is $795 (there are several clubs offering discounts that can save you considerably on registration. Look here). But as of March 31, the price goes up to $995. There are still seats available. 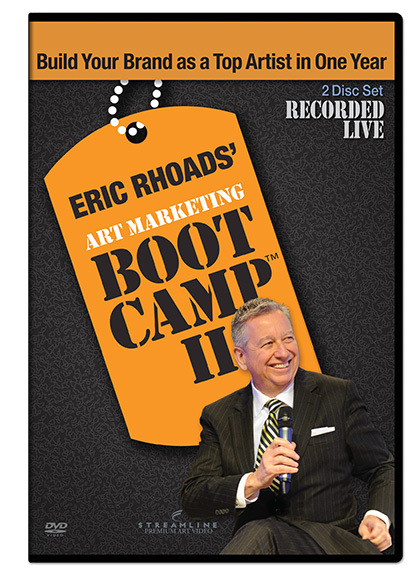 We are starting Art Marketing Boot Camp at 6:30 a.m. on April 12. It's a pre-conference session each of the first three mornings for the early birds. You'll be surprised at how many people won't get up early to change the direction of their future sales. On that day at the California Art Club, a well known artist came up to me and said, "Eric, as you know, I've been very fortunate in my career. I've achieved a fair amount of success, and I know a lot of that has been because of good marketing. 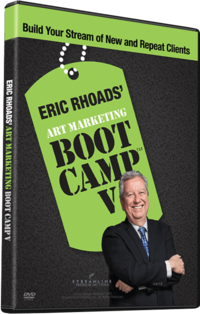 I've learned more in one day about marketing than I have in my career, and I'll be attending your boot camp in Las Vegas at the convention because I know I can be better." Good marketers know they can be better marketers. I hope you'll consider attending. I'd be honored to get a call from you one day when you say, "Eric, I listened, I followed most of your advice, and today I'm living the dream I never before thought was possible." If I've done that, perhaps I've left the world a better place.